I’m an American who has lived in Melbourne on and off for more than ten years. So, I feel qualified to write a guide to it, as a pseudo-local; it’s the best of both worlds, being familiar with a town, but still being able to see it with a newcomer’s eyes. You may not agree with everything I say here (especially if you’re from Australia), but that’s not the point, is it? This is still a work in progress, so suggestions and corrections are always appreciated. Melbourne is situated on Port Phillip Bay, but it isn’t a beach town. Putting aside the Central Business District (CBD), locals split the greater area into “North of the Yarra” and “South of the Yarra” — the Yarra being the slightly brown river that bisects the metropolitan area. The CBD itself is a grid pattern, oriented with the long edge roughly East to West. While the centre of the CBD is technically at Swanston Street and Bourke Street, the south side – near the Yarra – on Swanston acts as the focus of the city, thanks to the presence of Flinders Street Station and Federation Square (but we’ll get to them in a moment). The best way to get around is public transport, once you manage to get a ticket. Victoria now has a smart card system called “myki”. The good news is that it works on trains, trams and busses; the bad news is that it can be confusing, especially for tourists. There is a myki “explorer” available, but it’s only available at a few locations (the most convenient being Federation Square, in the middle of the CBD); if you can’t get to one of them, you’ll need to buy one on its own and then add some money to it. Note that you’re not required to register it. If you don’t have a working phone or will be driving in the country (“bush” and/or “outback”), the Melways is the traditional map of Melbourne and surrounds; it has a fantastic level of detail (and corresponding heft). You can also use taxis, but beware that Melbourne’s taxi industry doesn’t have the best reputation. A good alternative is Uber. Sorry, Lyft doesn’t work here yet. Every city has a few sights and curiosities that visitors feel compelled to see; Melbourne is no different. These are a selection of the better ones to tell people about when you get back home. One of the things Melbourne is well-known for is its trams. They’ve changed a lot over the years; mechanical ticket-selling monsters replaced friendly conductors in the 1990s, then the monsters left and now you can’t buy a ticket on a tram at all. Charming old wooden trams have been replaced by huge, sleek european-designed lozenges. The city circle tram is a refuge from all of this; it lets you see how Melbourne’s trams used to be, while giving a quick tour around the CBD. And, since it’s a tourist service, it’s free. 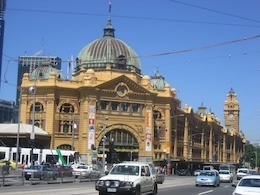 Flinders Street Station is the spiritual anchor of the city, serving as a meeting place (“I’ll meet you under the clocks” becomes clear once you see it) and transport hub. Make sure to take your picture in front of it. Across the street from the station is Federation Square. Although we had lots of doubts about it while being built, “Fed Square” actually works quite well as a focal point for the city, with lots of cafes, shops, free outdoor movies, cultural events, and people watching. Melbourne is well-known for the life in its laneways; what began as putting unused space to good use by low-budget cafes and bars has become a way of life, with many new city developments including faux laneways in their midst. One of the best-known examples is Degraves Street, just off of Flinders Street between Swanston and Elizabeth. It draws a lot of tourists as well as locals, due to its hard-to-put-a-finger-on “European” feel, as well as a prodigious amount of graffiti at one end. Across Collins Street and to the left, the Block Arcade leads to the Royal Arcade. Both of these are great examples of Victorian architecture and must-see for tourists. You can stop at the tea rooms (beware of the queue, though), or in one of the many cafes, such as Segovia. The city also has an extensive Chinatown that’s worth a wander around, as well as a meal or two. Just outside of the CBD to the North is the Royal Exhibition Building; this is a historic building (in fact, a World Heritage Site) that’s worth a look through if you’re in the area, or if you’re particularly interested in Victorian exhibition architecture. If I were in town for just a few days, I wouldn’t detour for it. Likewise, the nearby Melbourne Museum is great if you have bored kids, but not worth valuable holiday time otherwise. Queen Victoria Market on the North side of the CBD, and it seems to drive tourists to delight – especially Americans, who don’t have much exposure to food coming from somewhere other than a supermarket. On the other side of the Yarra, the Royal Botanical Gardens are very much worth a few hours’ stroll; the views of the gardens as well as the city are breathtaking, and you can stop for lunch or afternoon tea. South of the gardens is the Shrine of Remembrance, a massive monument to Australians who served in war. It’s actually quite moving to go there, with a comprehensive museum underneath. If you climb the steps to the top, you’ll get a great view of the city as well. On a different note, just across the river from the CBD is also Crown Casino. We call this the “Idiot Tax”, and if you choose to spend your money this way, you’re more than welcome, but be aware that the bouncers have a tendency to get rough. Don’t bother wandering down to the Docklands while you’re over that way, no matter what the New York Times says; it’s a tacked-on district without a soul, at least yet, and it’s not terribly pedestrian-friendly. Finally, you can pay to walk into a glass box hanging off the side of Eureka Tower (the tallest residential building in the Southern hemisphere! ), if that’s your thing. Healesville Sanctuary is about an hour’s drive out of the city, and lets you see a number of native animals in a natural setting. The Great Ocean Road is a twisty, windy road along the Southern Ocean (OK, technically, Bass Strait) that passes, among other things, the Twelve Apostles (although their number has been diminished by nature). It’s a very long day trip, or a comfortable overnight trip, but beware that in the summer months, the traffic will be intense, since this area serves as Victoria’s holiday home. Daylesford and Hepburn Springs are nice little spa towns, about an hour and a half from the city to the Northwest. You can take a train there as well. See DABS for accommodation. Finally, you can go to Philip Island to see the penguins. This has become a big business, with stadium seating and guides, so don’t think you’ll be able to get intimate with the little guys. Alternatively, you can also see a much smaller penguin colony in St Kilda, which is an easy tram ride away from the city. In all cases, if you don’t have a car, you can arrange a bus with a tour group, or hire a driver for a day. Beyond the standard tourist destinations, there are a few interesting areas to explore in Melbourne. Fitzroy and Brunswick are northern suburbs that are variously described as “hip”, “young”, “edgy” and “becoming rapidly gentrified / yuppified”, depending on who you talk to. Regardless, there are lots of interesting shops, pubs and great food here. Brunswick Street is the main attraction in Fitzroy; Sydney Road in Brunswick. Both are easily accessed by tram. St Kilda is a pleasant beach-side suburb that was the Fitzroy of twenty years ago; i.e., it started out as a very “arty / edgy” neighborhood, but has been gentrified, with the corresponding raise in prices, hipster sightings and crowds. They have a festival every year that we generally avoid, because of both the size and nature of the crowd. Albert Park Lake has lovely walking and cycling paths, and you can rent a paddle boat or a sailboat to navigate this extremely shallow body of water. Just to the west is the Melbourne Sport and Aquatic Centre, if you’d like to swim. While the Queen Vic is a great working market, there are many other neighborhood markets that have interesting food and people. A favourite is Prahran Market, just around the corner from the shopping on Chapel Street. With a large, diverse immigrant population and ready access to a lot of fresh food, Melbourne is deservedly known as a food city. Pretty much any cuisine – with a few surprising exceptions – can be found here. As a result, recommending restaurants is difficult; in such a busy scene, they come and go quickly, and can change from wonderful to average in a short time, or vice versa. What I can do is make some general recommendations, and list a few favourites that stand the test of time. Lygon Street in Carlton is the centre of everything Italian. Favourites here include Tiamo for food and Brunetti’s for sweets. For Vietnamese, you have to go a bit further; take a number 109 tram up Collins Street (towards Parliament) and stay on it until you get onto Victoria Parade; once you pass Hoddle Street and under the train tracks, you’re in Abbotsford, and should have no trouble finding something tasty. Likewise, the CBD’s Chinatown has a wide variety of Chinese restaurants, as well as a few Malaysian ones tucked up near the Parliament end. Local Thai and Indian food, on the other hand, is authentic and delicious; if you’re from the US, you should go out of your way to try the Thai, because it’s difficult to get real Thai food there. Hellenic Republic isn’t convenient to the city (take the 1 or 8 tram), but it is a fantastic, family-oriented Greek taverna run by George Calombaris, an Austrlian celebrity chef. Well worth the trip. 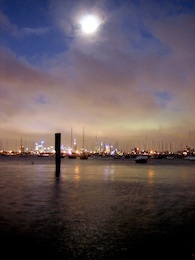 The Stokehouse and Donovans are both right on the beach in St Kilda, and both a lovely place to watch the sun go down. The menus tend towards seafood and meat prepared simply. France-Soir is a well-run French brasserie that’s been in the heart of South Yarra for more than 25 years. Good, up-to-date resources for finding restaurants include the Good Food Guide (note, you can get this as an iPhone app),. Australia and Melbourne both claim a number of foods as their own, even though they’re not really “local”, in the sense that they hail from a long history of a national cuisine. Of course, you can try more exotic and obviously Australian meats, such as kangaroo (gamey) and emu (I have no idea), but if you want an “authentic” Australian experience, realise that it’s likely going to be a riff on another cuisine, or an Australian take on “international” cuisine. The exception to this is that some restaurants are now incorporating native “bush” ingredients into their menus, with very interesting results; be on the lookout for them. Meat pies – small pastry crusts filled with some kind of meat, usually beef, and maybe vegetables – can be very tasty and filling. However, you need a good one; if someone offers you a meat pie that was recently in a freezer, politely refuse and find a local bakery or specialty shop. Another very, very important rule is to never, NEVER attempt to eat a pie floater, no matter how much you’ve had to drink. That’s what they do in Adelaide, and the results speak for themselves. A cousin of the meat pie is the sausage roll, which is as dubious as it sounds. Both are usually eaten with tomato sauce (“sauce”). Fish and Chips are another overseas food that’s been made into something special here. Not to be confused with the British version, the Australian version is often served in paper, and is a sort of fast food. You’ll need to go to a fish and chip shop (i.e., a place dedicated just to this food), and ask for “fried flake”; ignore the fact that it’s shark and you’ll enjoy the best fish you’ve ever tasted. Most people agree that the best fish and chip shops are run by Greeks, although the Vietnamese can give them a solid run for their money. Dim Sims or “dimmies” were created in South Melbourne market, despite their obvious Chinese influence. In a nutshell, it’s a steamed dumpling filled with meat that’s eaten piping hot, usually with soy sauce. They can be found in most fish and chip shops, and some speciality shops at markets (including South Melbourne). Scones are what Americans would call biscuits (which is the local name for what Americans call “cookies”). They come with cream (which is not for coffee, Americans; that’s just “milk”), usually “double cream” or “triple cream.” Your cardiologist will not approve. Jam Donuts can be found in a truck at the Vic market, and a few other places around town. Hot and gooey with a huge sugar hit; enough said. Lamingtons are wonderful, and can be found at most bakeries and markets. There’s a minor controversy about whether or not to have the ones with a thin layer of jam; I’d recommend you try with and without, to decide for yourself. Pavlova is yet another wonderful dessert made of meringue with cream (see above) and fruit. Highly recommended, but don’t get into an argument with a Kiwi (New Zealander) about where it originated. Melbourne had a large influx of Greek and Italian immigrants in the 1950s, and as a result you’re able to get a very good coffee for very little money on almost every street corner. Starbucks tried to take over several years ago; they failed. Short Black – An espresso. Long Black – An espresso shot, with hot water added first. Flat White – Espresso with hot milk, but no froth. American Coffee – Thin, US-style coffee. Not commonly found. For superlative examples of coffee, try Market Lane Coffee in Prahran Market, or The Final Step in South Yarra. Australians drink their beer in pubs. Often, you’ll see the word ‘hotel’ in their names, because long ago they were required to provide accommodation as well (and this can still be found, occasionally). For a proper experience, you’ll need to go into the suburbs; the CBD is filled with many, many bars, but not any real pubs in the sense that it’s a place where locals hang out (sometimes with music, sometimes not). You can listen to music with your beer at the Town Hall Hotel in North Melbourne. There are also a few local breweries that open their doors. Mountain Goat in Richmond is a bit hard to get to (take the 48 or 75 tram out on Bridge Road; get off at River Street, just before the river, and walk North until you get to North street) but well worth it, with excellent pizza and several brews on tap, along with a very relaxing atmosphere. Open in the evenings on Wednesday and Friday only; if you can’t make it (or don’t want to go that far), their beer is available in many pubs around town. One final word - if you like good beer, avoid VB, Carlton and pretty much any other mass-produced Australian beer, with the exception of Coopers (try the sparkling ale, a.k.a. “red”) and Cascade. While Australia does export a lot of wine, only a tiny amount of the variety produced here gets exported – and in my experience, only the worst mass-market wine and the very best get exported. So, clear your preconceptions of what Australian wine is and explore. If you can’t make it out to the Yarra valley (see above) or one of the other wine-producing regions, make sure you explore the wine lists in restaurants, or the wine shops (most restaurants will allow you to bring your own). The biggest shop by far is Dan Murphy’s, although you might come across Vintage Cellars more easily if you’re staying in the city. They’re followed closely by the wine departments of the two big supermarket chains, Coles and Woolworths. All of these are good for picking up a quick (and usually cheap) bottle of wine, but their range is limited to high-volume producers, and their staff’s knowledge is usually quite limited. If you want something more than that, try a smaller, neighbourhood store, such as Winebins or the City Wine Shop. There are also a number of wine bars around the city that can be very helpful. If shopping is your thing, the CBD has many options. The newest and grandest urban shopping mall is the Emporium, and it’s right next door to two other great options, Melbourne Central and the QV. If you want something smaller-scale, it’s best to wonder through places like Collins Street and Flinders Lane. Further out, it depends on your taste. Chapel Street is known as the place to go for fashion, but honestly it won’t live up to your expectations; you’d be better staying in the city or going out to Chadstone. St Kilda Adventure Playground is a community-run playground with lots of dangerous things to climb on, ride and bounce off of. It’s got a pretty crunchy-granola-hippie flavour to it (you can make yourself a cup of tea on the honour system), and there’s no way it’d ever happen in the States. It’s ace. Luna Park is an amusement park in St Kilda, modeled on Coney Island. There are a number of rides, including the Scenic Railway, a 100+-year-old wooden roller coaster. If you go to Federation Square, wander further up the river to Birrarung Marr to see the Federation Bells. The Children’s Garden at the botantic gardens is great fun for a surprising range of ages, with pathways cut through bamboo forests and jungle-like plants, a stream to walk through, and a working garden. Melbourne Museum is what it sounds like; a museum about the city, its history and culture. They do make it kid-friendly, and sometimes there are great exhibits, but don’t expect it to fill more than a few hours. If your kids like sports, the National Sports Museum at the MCG may or may not hold their attention. ScienceWorks is hard to get to without a car, but worth it for kids who like anything to do with science. Try the ferry. Melbourne has several good public pools. MSAC is the biggest and one of the most central, with a wave pool, water slide, a number of choices for pools and lots more. Collingwood Children’s Farm is another local tradition, very non-commercial. It’s also right next to Abbotsford Convent, which often has good markets. Melbourne Aquarium is probably like most other aquariums you’ve been to; it has lots of fish, sharks, and tends to take money out of your pocket. However, it does have penguins, and most kids really seem to like them. The National Gallery of Victoria is where you go to look at art. Make sure to drag your hands through the water wall on the way in. ACMI is the Australian Centre for the Moving Image, conveniently located in Federation Square. The Arts Centre is the nexus for Serious Performance Art. Tucked behind the NGV, the Melbourne Recital Centre is the newest kid on the block, with a good program in a more intimate space. Melbourne also has a decent theatre district, if you’re into shows and/or musicals. Of course, there are also a lively music scene in town; see the gig guide for more information. Melbourne’s calendar is packed with festivals and events. This is an edited list of highlights; for much more, go to the Melbourne event listing and TimeOut Melbourne. The Australian Open is a “grand slam” event, and great fun. Be aware that tickets for the later matches sell out quickly. The Midsumma Festival is Melbourne’s celebration of queer culture. St Kilda Festival is usually hot, overcrowded with obnoxious people and too loud. Can you tell we give it a miss? The Melbourne Grand Prix brings lots of noise and stuffs up traffic every year. Moomba used to be called a “water festival” until the health folks started recommended against touching the river. Now it’s more about music. Melbourne Food and Wine Festival practices truth in advertising. In a food town, it’s a pretty serious affair. The Melbourne International Comedy Festival is big, and great fun. Go as much as you can. The Melbourne International Flower and Garden Show in Exhibition Gardens is actually quite interesting and pleasant to go to, even if you don’t have a green thumb. Open House Melbourne sees all kinds of interesting buildings and spaces in the city open up; make sure you take advantage. The AFL Grand Final is the climax of Melbourne’s (sometimes unhealthy) obsession with sport. The Melbourne Festival took “arts” out of its name, but it remains an arts-focused event. Meanwhile, the Fringe Festival is an independent arts festival, and much more interesting. They say the nation stops for the Melbourne Cup horse race, but as far as I can see, people drink a lot and have a BBQ, or the dress up, go to the track and drink a lot. The Big Design Market is a chance to see (and maybe buy) what cool stuff the city’s myriad designers and artists have come up with. Finally, the Boxing Day Test Cricket is one more chance to watch some sport. For those not from the Commonwealth – while this says “boxing day,” realise that a test match lasts five days. Bring supplies. This document is Copyright © 2002-2017 Mark Nottingham and is licensed under a Creative Commons License. The latest copy can always be obtained from https://www.mnot.net/guides/melbourne/.